If you plan on driving to France this Easter, be sure to display an emissions sticker in your windscreen or risk a £117 fine. 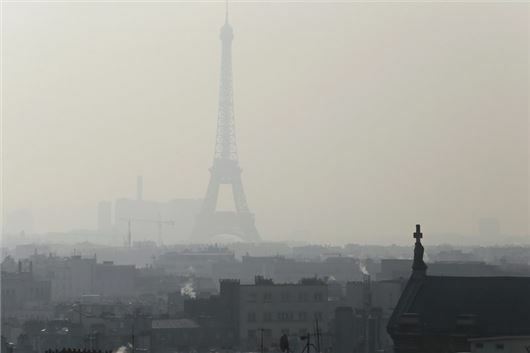 In a move to cut thick smog, which has been blanketing Paris in recent months, a colour-coded emissions sticker system was introduced in January to help cut severe pollution in the French capital. Major cities like Lyon and Grenoble also require vehicles to display stickers. The stickers cost £3.60 (€4.18), including postage to the UK, but motoring groups warn that they can take up to six weeks to arrive. They can be ordered here. The penalty for failing to display a sticker while driving in Paris is an on-the-spot fine of between €68 and €135 (£58 and £117). The new Crit'Air stickers cover six categories, from the cleanest electric or hydrogen-powered vehicles (a green sticker) to the dirtiest (a grey sticker). They indicate the vehicle's age, engine type, petrol or diesel and cleanliness rating. Only emergency vehicles, vintage cars and some delivery and security vans will be exempt. Some vehicles are completely banned from driving in Paris, from Monday to Friday, between 8am and 8pm. These include any car registered before 1997, scooters and motorbikes from before June 2000 and trucks and buses from before 2001. These measures are the first steps towards an outright diesel vehicle ban in Paris by 2025. The mayors of Mexico City, Athens and Madrid have also agreed to implement this ban to improve air quality in their respective cities. The Mayor of London, Sadiq Khan, has also taken strides to expand the planned Ultra-Low Emission Zone in Central London. Khan recently issued extensive measures to lower the 9500 deaths attributed to air pollution in Britain's capital. A new vehicle scoring system, which will allow drivers to see how much NOx gasses their diesel car emits under real world driving conditions, has been launched in London and Paris. The scoring system will “put an end to the smoke and mirrors that have been employed in official emissions tests” according to Khan. The launch of the online car checker in October will coincide with the introduction of the T-Charge, which will require all cars registered before 2005 to pay an extra £10 to enter the London Congestion Zone from 23 October. How do I apply for one?? Follow this link and it will take you to the application for vehicles that aren't registered in France. We applied online at certificat-air.gouv.fr/en/demande-ext/cgu and received an invoice and temporary certificate by email within 24 hours. The actual certificate arrived in the post 4 days later. Important to note that if you travel North->South past Lyon (but not actually into Lyon) the main road passes through the monitored zone. Why don't you say upfront what you really mean, namely that this applies only in certain cities, not to the whole country? The headline and first paragraph are thoroughly misleading. I can't see any reference to the Euro compliance type on my V5 certificate - the car was first registered March 2013 - so not sure how to apply and provide proof of compliance. Any suggestions please? Just follow the link on the official website, look for the Union Jack in top right hand corner. You just need your Vin (chassis) No and your Registration No. As above, I got my email confirmation very quickly and the sticker arrived by post five days later! It also applies to several cities in Germany Berlin, Munich, Frankfurt.Again thay need to see your V5 cost appx 6 Euros. The AA web site is a good source of information. A big thank-you for this article, HJ! I knew nothing about this new system and I'm taking the car to France in a few weeks. I used the English language website (certificat-air.gouv.fr/en/demande-ext/cgu) to apply and had no problems. You don't need to know your Euro compliance code or your emissions level, as filling in these fields is not compulsory. Strasbourg snow another city using it. I was emailed an invoice and a copy of the sticker etc. Can this be used in your window until I get the full size one. I assume any ANPR cameras will not be an issue as the van has been registered.